What are the hurricanes and earthquakes really about? Gaia has been throwing some very heavy weather events at us these past months so what is it all about? Mother Earth is trying to cleanse herself from all of the negative energy that we have created on her body. She is shaking herself like a dog shakes herself dry or shakes off fleas. We have been living unconsciously in such a way as to generate a layer of negative energy like a crust which is suffocating her. Old structures based on greed, competitiveness, self interest and hatred have no place in the New Earth and are blocking her from moving forward into her fifth dimensional light body. Like a snake shedding her skin the old one has to be split and shed so that the new one can be revealed. Just as Gaia is releasing her negative frequencies, so we humans are also clearing old programs which have been holding us in self doubt, lack of self esteem, fear and separation. These programs are preventing us from moving forward into our ascended light bodies. Mother Earth is cleansing herself with the hurricanes and earthquakes but she is also trying to get our attention. We have moved so far away from simple values of living from the heart and the importance of community. We have been putting our focus on self interest, accumulating possessions and getting ahead at the expense of personal connections and family life. Gaia is trying to realign us with values that are of primary importance such as people, family, animals by challenging us with the possibility of losing all of our possessions in natural disasters. Our lack of consciousness is the cause of these dramatic events but we can also use consciousness positively to help Gaia to release her blocked energy so that she doesn’t need to generate all the storms which take a lot of energy from her. Remember that Gaia is a fully conscious being and we can always work with her as we have done in many lifetimes as druids and other cultures who worked with weather elementals. We offer to assist them and then ask them if they would co-operate with us to calm the winds, rain, hurricanes, tsunamis and earthquakes. We can help by visualizing her surrounded in light, seeing droplets of light penetrating the crust which is suffocating her and dissolving all of the negative energy which we have created. 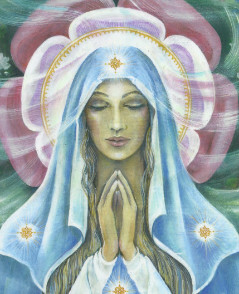 We can “see” her as being already cleansed and restored to wholeness. Focus on sending the light into her crystal grids so that they can amplify it and take it wherever it is needed. Mother Earth does not want to harm any of us, she just needs us to wake up and change our ways. We can help her by opening our hearts to all living beings and begin to live in joy, dancing and singing to lift both ourselves and our Mother. As we begin to share unconditional love and to spread it to everyone we meet then we are healing her. As far as our own healing is concerned we also need to release the crust which is preventing us from moving forward into our ascension. It is time to release old patterns of focusing our attention on acquiring possessions, wealth and status. We have been conditioned to value ourselves by what we achieve in terms of business or material success and we have forgotten to feed the soul. We are all carrying wounds from our childhoods of self doubt, lack of self esteem and confidence, abandonment and shame. Mother Earth has created these life threatening events partly to help us to focus on what is really important which is people and animals not ‘things”. Visualize yourself standing in a beautiful stream of light which is pouring down from the Source and is infusing every cell in your body, dissolving all of the old programs from the past which are holding you in separation and limitation. All old thought forms of lack, self doubt, “I don’t deserve,”” I always fail,” ‘I’m not good enough,” are being dissolved in the golden light. Send gratitude to Mother Earth for her patience with us, ask forgiveness for all of the harm that we have caused her by our unconsciousness. Let her know that we are here to support her in her rebirth process and we are truly grateful for all of the gifts that she blesses us with. Many Masters from the universe are here to build a new Earth based on love and harmony. Are you ready to step up, to claim your mastery and help our Mother to cleanse herself of hatred and greed? It is important now as never before that the Lightworkers who are here to lift this planet into her ascension, awaken to the truth of who you are and begin to raise your frequency and with you that of the earth and all humanity. “I feel more confident and able to stand up to people who don’t see the real “me.” When you have confidence and no triggers it doesn’t matter what they are doing. I don’t retaliate. I felt a deep connection to each of the people in the group, and I learned a lot about myself. I feel much more powerful than I have ever felt in my life. All of my friends are 3 D people, full of anxiety and fear but this is a different energy. It is safer and higher and it feels so good. I feel so much more comfortable with who I am. In each class we we will visit one of the temples of the Ascended Masters to receive initiation and to learn how to channel them.This is a class for empowerment of your authentic self. You will receive the recording of each class . This is a 6 week series of classes of 2 hour sessions using video conferencing. You can join by phone, I pad or computer. You do not need a an account. I am offering the same class at 2 different times. Choose which time suits you best, the classes are the same. We came to Earth together in teams where we worked in the great temples of Atlantis, Lemuria and all of the spiritual traditions since then. Gaia is calling the teams together now to remember who we are and to reclaim the knowledge that we had then. The Lightworkers are here to help Her to move into Her Ascension and Her body of light. It is most important at this time to connect with our soul family and kindred spirits who are spread all over the planet. The Earth appears to be spiraling into chaos but this is only on the surface, Many Masters from the universe are here to build a new Earth based on love and harmony. Are you ready to step up, to claim your mastery and help our Mother to cleanse herself of hatred and greed? It is important now as never before that the Lightworkers who are here to lift this planet into her ascension awaken to the truth of who you are and begin to raise your frequency and with you that of the earth and all humanity. In each class we will work together traveling to the Temples of Sirius, Pleiades, Greece, Egypt, Avalon and many more to reconnect with our multidimensional aspects and use them to reclaim the aspects of ourselves which are already in full consciousness and to lift the Earth into Her Radiant Light. Everybody will participate in our group journeys speaking messages from our many aspects. This is a class for empowerment of your authentic self. You will receive the recording of each class . Copyright © *2017|*, All rights reserved.